Heroes of America (HOA), also referred to as the "Red Strings," was an underground, pro-Union organization operating in North Carolina, Virginia, West Virginia, and perhaps other southern states during the Civil War. Its ranks were composed mainly of deserters, draft dodgers, and Unionists as well as some slaves and free blacks, and its purpose was to protect its members from Confederate authorities. 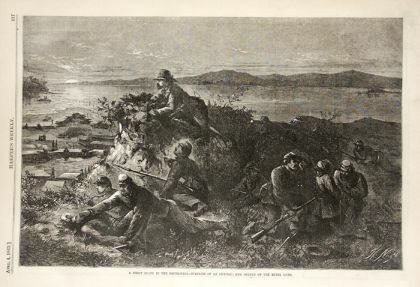 Those members engaged in a range of subversive activities, including encouraging disloyalty on the home front and desertion in the Confederate army, providing military intelligence to Federal authorities, maintaining an underground railroad to spirit members to the Union lines, promoting the formation of anti-Confederate guerrilla units, and furthering class conflict by promising the poor a postwar redistribution of the wealth of the planter class. The HOA likely had its roots in a group of armed Unionists who emerged in central North Carolina in July 1861. Confederate troops quelled the insurgency and charged the men with treason. The best-known organizer and leader of the HOA was John Lewis Johnson, a druggist and physician. The organization's Grand Council, formed in Raleigh, became the center of HOA activity. Johnson eventually inspired the establishment of a National Grand Council in Washington. The HOA strongly supported the peace movement begun in 1863 by William W. Holden, editor of the Raleigh-based North Carolina Standard. In 1864, when Holden challenged incumbent Zebulon B. Vance for governor, the leader of the peace movement was publicly accused of being a leader in the disloyal HOA. Fearing reprisals, few of Holden's supporters showed up to vote for him, and Vance won by a landslide. With Holden's defeat, the HOA ceased to play a role in the politics of Confederate North Carolina. Through the efforts of North Carolina members, however, the HOA had spread to southwestern Virginia. By the winter of 1864, bands of deserters and disloyal county officials, many of whom belonged to the Red Strings, controlled much of the region. During Reconstruction, the HOA protected its members (including numerous Union army veterans from North Carolina) from hostile ex-Confederates. It is ironic that the HOA, a clandestine terrorist organization, served as a model for the Ku Klux Klan, which was purportedly organized in part to counter the power of the Heroes. In the gubernatorial campaign of 1868, the HOA aligned itself predominately with the "scalawag" wing of the Republican Party, supporting the winner of the election, William W. Holden. During the Civil War and Reconstruction, members of the HOA were prime examples of the "Other South." They were southern whites who, during the war, opposed the Confederacy and, during Reconstruction, supported the Republican Party. Their story challenges the often-held view that the nineteenth-century South was monolithic in its beliefs and attitudes. William T. Auman and David D. Scarboro, "The Heroes of America in Civil War North Carolina," NCHR 58 (October 1981). Gerard, Philip. "A Separate Peace." Our State. November 2011. http://www.ourstate.com/civil-war-pacifists/ (accessed May 23, 2014). Union scounts in the South on Night Patrol. Harper's Weekly, April 4, 1863. Drawing by Thomas Nast. Available from Son of the South from http://www.sonofthesouth.net/Civil_War_Union_Soldiers.htm (accessed May 15, 2012).